In 2014 Tate Britain held the exhibition ‘Kenneth Clark: Looking for Civilization’. This was the first show devoted to Clark, one of the most influential figures in the British art world during the last century. Clark fulfilled many roles during his professional life; that of scholar, educator, collector, patron, writer, administrator and broadcaster, and in all he stayed loyal to his central belief in the importance of art for human life. At the heart of this exhibition is an examination of the support Clark gave for modern British artists, as during the 1930’s and 1940’s he was one of the most active collectors of contemporary British art. In the Attic Studio at Charleston, we have recently identified a series of interesting sketches by Duncan Grant that form the basis of a commission for Clark. 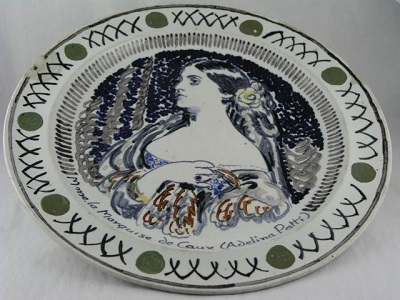 The ‘Famous Women Dinner Service’ is a collection of forty-eight plates that Grant and Vanessa Bell designed as part of a one-hundred and forty piece set. 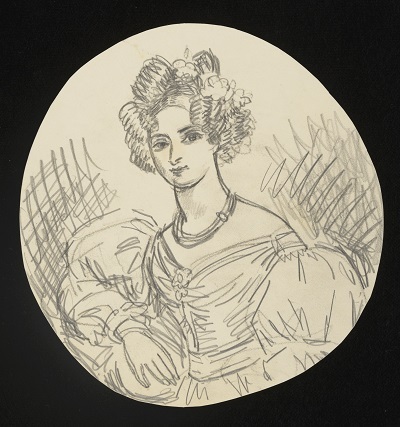 It is one of the largest commissioned works produced by the Bloomsbury artists and sketches for a number of plates and of different ‘Famous Women’ have been found as part of our on-going exploration of the Angelica Garnett Gift. Clark had already purchased and commissioned various works by Grant; two pastel studies from an exhibition in June 1933, a 1932 Wedgewood cream-wear jug incorporating images of Clark and his wife Jane, and a portrait of Jane that, while taking several years to produce, nevertheless sealed the friendship between the two men. ‘Billy’ envisaged Grant and Bell reviving the ‘hausmaler’s’ art (the term used to describe painters of faience, porcelain and glass who bought blank pieces from factories to decorate at home or in their workshops) and he introduced them to Mr. Wreford, an agent at the Wedgwood showrooms at 24 Hatton Gardens. At the showrooms Grant and Bell were shown the various blank services that were available for their decoration. Shunning the modern styles, the pair selected a more traditional design, similar to the 19th century moulds that were used at the Aubagne pottery which was founded in 1837 in Provence. Having selected the style of plate Grant and Bell went to stay with Josiah Wedgwood and his wife, taking tours around the works and painting experimental designs on white plates. It is the initial designs for the dinner service that we have found in the Gift. 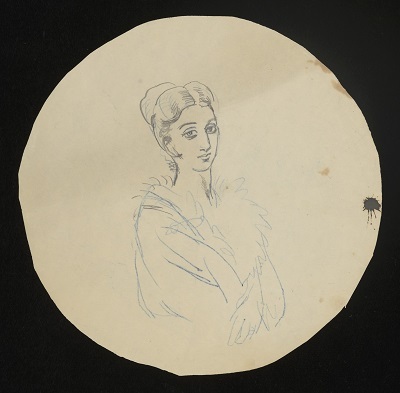 These preliminary designs were carried out on round scraps of paper and card and depict portraits of women throughout the ages in pencil and ink. 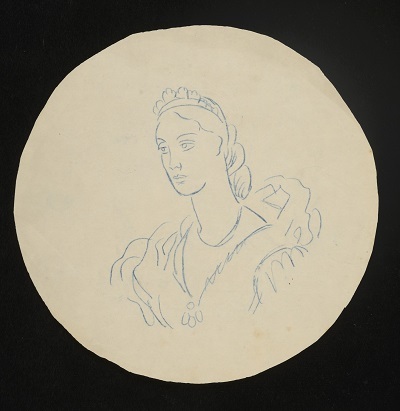 The artists had settled on the theme of ‘Famous Women’ for the commission and produced decorative images of twelve queens, twelve famous beauties, twelve writers and twelve actresses, in addition to a set of period women and two portraits of the artists themselves. Virginia Woolf was also included in the set, alongside ‘Miss 1933’ which caused Bell to remark that ‘it ought to please the feminists’. We have four tests for the plates in our collection at Charleston which were loaned to Tate for the 2014 exhibition. They show images of Madame Adelina Patti (a highly acclaimed 19th century opera singer), Queen Mary, Princess Mathilda and an unidentified woman. 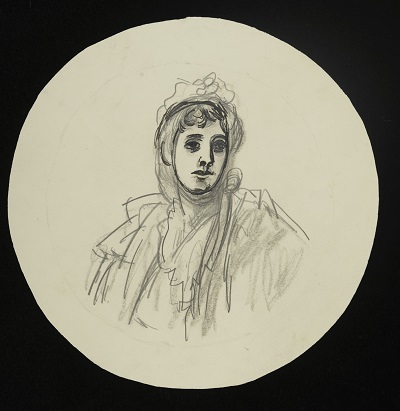 The women we have found on the preliminary sketches are also unidentified, yet they are a great example of Grant and Bell’s design process for a commission that took over a year to complete. 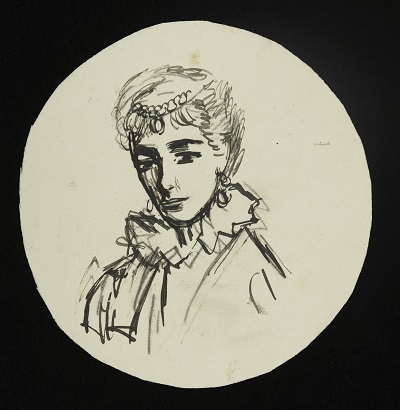 Other sketches for the ‘Famous Women’ series are currently in private collections, such as those depicting Virginia Woolf and Greta Garbo. The design for Queen Christina of Sweden currently resides in the Victoria and Albert museum in London. The whereabouts of the original forty-eight plates and other items that made up the one-hundred and forty strong dinner service are unclear. We know that they remained a part of Clark’s household until his move to Saltwood Castle in 1956, having already survived the Blitz and numerous changes of address. We also know that following the death of Jane, and the marriage of Clark to the French heiress Nolwen de Janze Rice, the dinner service along with many other works in his vast collection were moved to homes in Normandy and London. 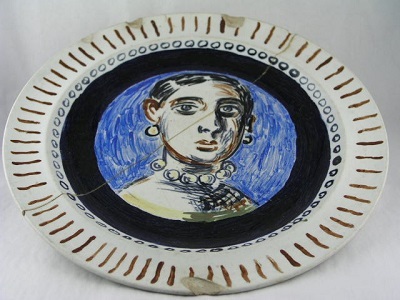 After that we can only speculate to the ownership and location of the dinner service, as it has been suggested that they were last seen at an auction in Hamberg in around 2000.